With this reservation, Fast CPR will come to your organization and conduct training at your business facility for your employees or your group. Fast CPR Mobile Team arrives with required training equipment and supplies to your business location to deliver the class and train your employees on the reserved date. Cards/Certificates are delivered at the conclusion of the class for those employees who have passed the requirements. Your company provides the training space. Onsite class reservation fee is $570. The fee is paid through our secure reservation site, by picking an onsite class date. This is the required fee for us to travel to your business location with van(s), electronic training and testing equipment, simulation devices, teaching props, kits, educational supplies and personnel. The fee also covers the first six participants training, certification and training material costs. If you have more than six participants on the actual class date, these participants will be invoiced separately to your company after the class is complete. The rate that will be charged for each of the additional participants will be the current per person onsite reservation rate you see here ($570 divided by 6), plus a 10% discount. Other discount options are possible for group volumes of 15 or more. However, we ask serious business customers to read through this page before contacting us. We also suggest not assigning temps, new hires or inexperienced personnel to do price shopping on behalf of your business through collecting estimates on vital business purchases such as compliance training, without them first understanding how the training industry operates. Thirty years of training industry experience has shown us, reservation fee for six is not a problem or even a drop in the bucket for any well managed Hawaii business that is used to paying their bills and that is used to hiring services of a nationally recognized institution like us. We understand that in Hawaii with each business, each AP (accounts payable) department operates at a different speed, while some accounts payable departments do not operate at all until their business expenses are turned over to collections. Having a reservation fee of six helps us recover the initial cost of delivering a class to any business, regardless how their AP department operates. The reservation fee also helps us make sure an informed decision maker within a real business is making the reservation. Having this filter helps with random folks haggling cheap prices without having a clue about who we are, what we do or knowing anything about our industry. Assuming the real definition of a Hawaii small business, or even a micro business, most businesses should be able to afford our services if they are really a business, if they really have a place for us to conduct training and if they really have employees for us to train. For business that are not solvent, that cannot pay for the compliance training for their employees, or even lack the initial funds required to set up a reservation, we offer third party financing. You should understand how the training industry works so you can understand what you are buying, that way you can look for actual service and delivery capabilities to your business, instead of looking only for labels, brandings, names or acronyms. Business customers already possess the necessary business analytical skills, it may already be clear to most why a lot of the confusion in the training industry is intentional, why everything is made to look the same. Through logic, most business customers can come to the conclusion, that the training industry is all about distribution of something, regardless if it is knowledge, product or service. As you look at the training industry, as a business customer seeking training for your business, make sure you can distinguish between the service distribution segment (Skilled labor, paid talent pool, delivery capabilities, Infrastructure, actual resources etc. ), the education distribution segment (content, intangibles and knowledge) and the product distribution segment (training equipment, cards, books and other educational materials etc.). You need to be able to clearly see how all that is merged in the training industry, where one segment ends and where the others begins. In dealing with the supply chain, you need to understand when it is the service distribution and when it is the product distribution. You must also understand the support capabilities and responsibilities of each of these to your business. Therefore, ultimately understand who will be responsible to your business in return. As a business customer, all of this will be necessary before you can make informed business purchasing decisions and distinguish the purchase options for your business in the local training market. 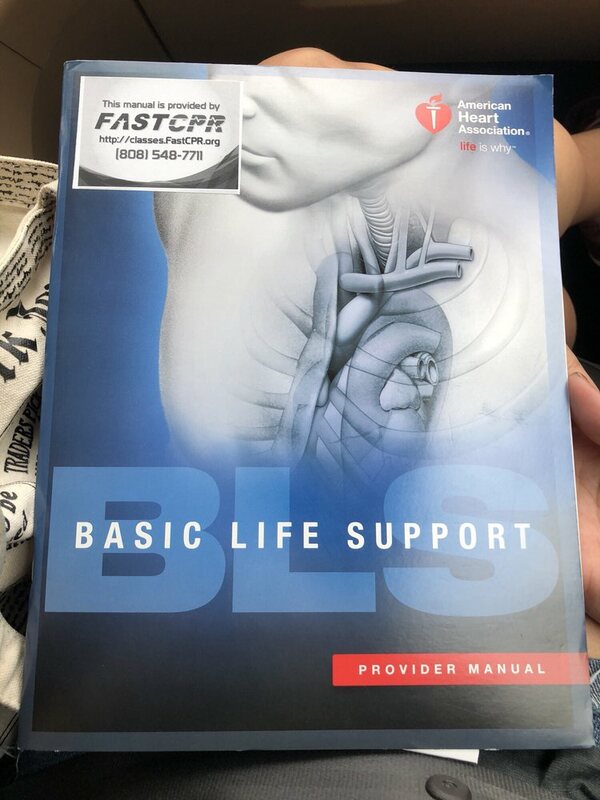 After doing your homework you should know, Fast CPR is a nationally recognized 501(c)3 training institution, that was started locally in Hawaii with support and encouragement from thousands of our students. But all those thousands of happy students started with just one. Keep in mind, ours is a repeat business. We have a large local following, because we are best at what we do. You can be rest assured, Fast CPR is the right choice for the training needs of your business. When we come to your business, the onsite class content we deliver is specific to type of certification required for your industry. You must tell us what is written on your industry paperwork ahead of time, so we will use the specific content. Over all, your onsite class will include presentations and hands on skills training by Fast CPR Trainer(s) using human talent and human ability to teach, while utilizing approved audio visuals and teaching materials. Fast CPR has brought premier training to Hawaii’s top businesses through Fast CPR’s resources, paid talent pool and Fast CPR’s proprietary business systems. We understand how customers really feel about compliance training. We can turn required compliance content into a fun, enjoyable learning experience for the class participants, while maintaining the integrity of our premier service. Plus, we use the highest cutting-edge, yet at the same time human friendly technologies in our training equipment to deliver the hands-on skills training required by OSHA and other compliance bodies. Option 1: BLS Certification. Your onsite class covers professional rescuer level adult, child, infant CPR and AED, two men rescue etc. This is typically a medical industry or a healthcare license related requirement. Option 2: CPR First Aid AED Certification. Your onsite class covers adult, child, infant CPR, First Aid and AED (Shock Machine). This is typically an OSHA or other government entity related requirement. Available class dates are listed below. The reservation is made by clicking the desired class date link that is at least 48 hours into the future. As you go through the payment process, on the comments please enter the address of your facility where you would like your class to be held, finish the registration steps and that is it. Booking an Onsite Fast CPR Class is that easy! Once the reservation is received, you will be automatically sent a confirmation email with the roster details. Fast CPR Representatives will also be in touch during regular business hours to discuss the class start time, total volume after six and other adjustable details. Representatives will also conduct a needs assessment and a site feasibility survey. This is so that we can customize everything according to your business needs and for your specific location. There is never an extra charge for these additional services. Our mobile team(s) will arrive to the exact business address you have provided during the reservation and we will deliver the class on the date you have chosen. Certifications will be issued immediately, on the spot, for those who have passed the requirements. If there are extra participants on the class day in comparison to what the initial reservation fee covered, your company will be invoiced separately for these participants as described previously. Important: We are fast, but we do not have a time machine! In order to allow time for us to set up administrative processes and class delivery logistics for your business, please chose a class date that is at least 48 Hours into the future.